A Superhero For A Self-Absorbed Society Once a popular superhero, Captain Freedom's fame is in decline. 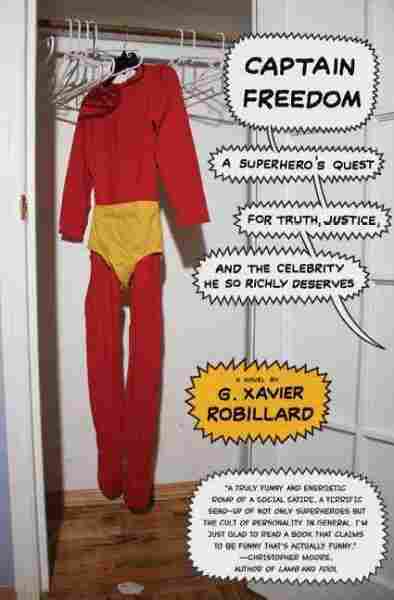 In G. Xavier Robillard's satire of our celebrity-obsessed pop culture, Freedom does what any self-respecting superhero would do: hires a life coach and starts searching for his roots. Captain Freedom is a superhero with his own personal Segway, a villainess girlfriend, an uncanny ability to predict the weather and a sidekick named DJ who uses the slow rock tunes of FM radio to put people to sleep. Cut loose by the upper management of Gotham Comix, Captain Freedom is at a crossroads. He must find a new identity and a new purpose in life. So he does what any self-respecting celebrity superhero would do: hires a life coach and starts searching for his roots. So begins Captain Freedom: A Superhero's Quest for Truth Justice and the Celebrity He So Richly Deserves. This skewed superhero is the creation of writer and satirist G. Xavier Robillard, who is also the comic genius behind the award-winning Web site All Day Coffee and a regular contributor to McSweeney's and Comedy Central. Robillard says he owes a debt of gratitude to Arnold Schwarzenegger, action-hero-turned-governor, who was something of an inspiration for the first version of Captain Freedom. 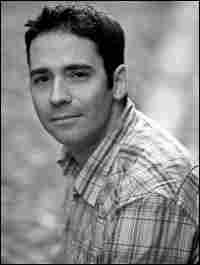 Robillard later turned his hero's story into a short humor piece for his local public radio station in Oregon. And from there, it grew into the novel, an outrageous satire of our celebrity-obsessed pop culture. Writer Christopher Moore calls it "a terrific send up not only of superheroes, but the cult of personality in general." This reading of Captain America took place on Feb. 23, 2009 at the McNally Jackson bookstore in New York. Whoosh! The forty-foot-long scimitar slices through the sky, aimed straight at me. It's a near miss, but the sudden partition of air created by the weapon produces gale-force winds. The air column pushes me backward several hundred yards, enough so I can size up my dreaded opponent. Genghis Kong, the giant Barbarian, has escaped from his unusually large prison off the coast, its powerful electromagnetic fencing disrupted by offshore oil exploration, and he's back in Los Angeles for a weekend of rest, relaxation, and wanton destruction. I fly back up into his face. "Your furlough ends now," I shout at him. Genghis came looking for freedom, but Freedom found him. I'm sure he can barely hear me. The sound of rotors from military choppers is deafening. Not sure what they think they can do, and the Pentagon's highly touted Barbarian Defense Shield has been a total failure. Genghis was part of the Monsanto giant laborer breeding program. The agriculture company had created an entire line of genetically altered superfoods, like twenty-foot rutabagas. Realizing they hadn't thought of a way to harvest the humongous produce, the company quickly bred giant farm workers to do the job. Unfortunately, the giants proved harder to control than the average migrant worker and escaped out into the world, seeking better-paying jobs and, in some instances, a life of crime. My cell phone vibrates in a hidden panel in my costume. It's nice to have, a great convenience, but I can imagine my mentor Chief Justice looking down from his Secret Headquarters in the sky and frowning. The man had no use for nondestructive technology. The Chief didn't even own an answering machine. I hover in midair. Holding still above Earth takes quite a bit of concentration—it's somewhere between treading water and doing Kegel exercises. I hope it's my sidekick calling. He hasn't been taking my calls lately. I don't recognize the number on the screen, but he's always losing his phone. "That's Captain," I correct, and know right away it's a telemarketer. "The New York Bank of the Americas has a great credit card offer." I have no time for this. "What's the APR? Annual fee? Do you have any way to capture a rampaging Barbarian?" "Uh, I'll have to check with my supervisor. Can you hold?" There is no way that Genghis is acting alone. He's a Barbarian, and though I consider myself a tolerant person and have several Barbarian American friends, they generally aren't the smartest group. And they stink. I'm relieved he didn't bring his giant horse. "Sir, we don't have anything specifically for Barbarians, but we do offer a concierge service and I'm sure they could help you with that sort of thing." "Great. Sign me up." I answer all the required questions impatiently but, I hope, without being rude. By the end of the day I should have a new DisasterCard—My Strife, My Card. I click off the phone, fly as fast as I can, and smack Genghis in the back. He ignores me and turns toward downtown L.A.
Whoever it is must be close by, but we're on an isolated patch of ruined freeway. It's just me, him, and the helicopters. Then I see it. One of the choppers has a different insignia, not Army or LAPD or Eyewitness News 7. The markings belong to that French triumvirate of terror, Les Misérables, and I'll bet anything that the Villain inside is Enfant Terrible. Terrible's supposed to be in jail serving out a long sentence for importing raw-milk cheese. Supervillains always get out. Sometimes a spectacular escape is involved, but they usually get released because of budget cuts. My day is already in a shambles, and I am angry. My career's entered an irrevocable tailspin. There's an important dinner party that I'm going to miss. My girlfriend isn't speaking to me. I'm in no mood for Enfant's merde. I fly up and rip open the helicopter door and step inside. "Thought you needed a breeze in here." The pilot looks confused and then taps on his helmet. He can't hear me. I grab a spare headset and repeat myself. "Captain Freedom," crackles the snide, nasal voice of Enfant Terrible over the headset. "The Barbarian is on a collision course with your beloved city. Think you can stop him? Or maybe you should warn the citizens first. Oh, the dilemma!" He laughs a French laugh. I fly away to face Genghis, and he pulls out another weapon. It's light blue and looks something like a mace. His arm flits down toward me, and I change direction quickly. So does he. We continue our deadly dance. I'm trying to figure out what he's holding. The sword was better. Where would you get a forty-foot sword sharpened, anyway? The weapon comes down on me. The uniform distribution of pores tells me what it is: a giant flyswatter. He's got me on the ground, pinned. I can't focus. Too many other things on my mind. There's been a little trouble at work. I've made some mistakes, but what can I say—I'm only human (partly). I need to get back to my party and fix things. If I don't get out of here, my soufflé will be ruined. But that's no reason to fight like an amateur. The implement presses down on me. I feel at least one rib crack. Nobody breaks my bones and gets away with it. The enormous Barbarian might be strong, but I'm stronger. I push with all my strength, breathing into the pain, and the flyswatter is off. Now that I'm free, I blast into the sky with a plan. The Misérables helicopter hovers nearby. Probably needs to be close by to control Genghis. After I catch the rotor in my hands, I rip it off and then grab the chopper by the skids. Heavier than I thought. After a few cleansing breaths, I wind up and heave it into the Pacific Ocean. Sure enough, Genghis follows it to save his criminal master. But there's one thing that Enfant Terrible doesn't know: Barbarians can't swim. The giant fumbles as soon as he's caught in the undertow and makes a tremendous splash as he flails in the water, hopeless as a cow without water wings. The Navy can handle it from here. A city is saved, but my evening is ruined. Do I get accolades, a key to the city, a poorly drawn crayon thank-you from a classroom of children who cannot spell? Instead of getting a ticker tape parade, I will soon be out of a job. Over and over, I ask myself why am I thrown out of the game, given the red card of life? Who is responsible? The Supervillain masterminds whom I've thrown into jail repeatedly? The international crime syndicate, INTERBAD? Traitors within our own government? 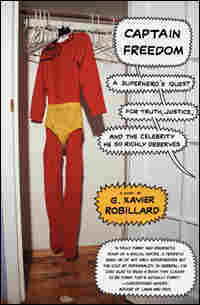 Excerpted from Captain Freedom: A Superhero's Quest for Truth, Justice, and the Celebrity He So Richly Deserves by G. Robillard. Copyright © by G. Robillard. Reprinted by permission of HarperCollins Publishers Inc. All rights reserved. Available wherever books are sold.